Kids Listen To Nirvana For The First Time, And Their Reactions Are Hilariously Priceless! If you’re a lover of rock music, it’s almost a guarantee you’ve heard of Nirvana. Nirvana jumped onto the scene in the 90’s, and brought forward a new sub-genre in the rock scene: grunge rock. Their deep lyrics and heavy sound inspired a generation, and paved way for many other bands to follow in their footsteps. Nirvana’s legacy has allowed them to remain relevant even today, however, the younger generation might not always be familiar with their music. 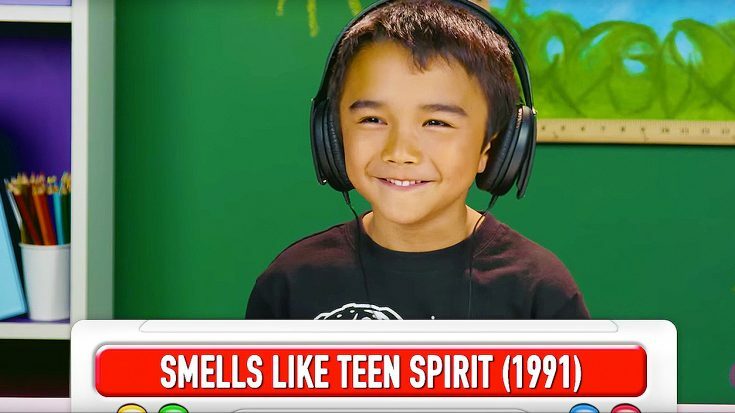 In order to introduce the younger generation to Nirvana, the people from FBE decided to make a video where kids react to hearing the band for the first time! The kids were played songs like “All Apologies,” “Heart Shaped Box,” “Polly,” and, of course, “Smells Like Teen Spirit.” The reactions were pretty positive, but some were mixed. Some kids had a disgusted look on their face at some of the lyrics, but overall, the music was pretty well received. There are also some legendary moments for comedy, and some great one-liners you’ll be repeating everyday! Check out the hilarious video down below, and let us know what you think!